Cards in Legends can be grouped by attribute, type, or rarity. Each card costs a certain amount of magicka to play, and the cards available depend on your deck, affected by the deck class as well as your card collection. Creature cards have two basic stats: Power and Health. In addition to this, many cards have bonus effects when played. Action cards have an immediate one-off effect, while Support cards can have an ongoing effect or a set number of uses. Item cards can be equipped to Creatures. You can earn new cards by obtaining card packs, although (with a few exceptions) the cards contained are randomly determined. All cards can be summoned for an amount of Soul Gems, depending on rarity. Cards can be earned by playing the stories, opening card packs, or winning battles. Your chosen race affects cards you obtaining through leveling. You can have up to three copies of a card in your deck (premium cards count towards this total) except for Unique cards, of which you may only have one. AI enemies are not affected by this restriction, and this does not apply in Arena Mode. You can have from 50 to 70 cards in your deck. If you draw all of your cards in a battle, you will be presented with a card called "Out of Cards" and your health will be reduced to your next unbroken rune. If you have no runes remaining, it reduces your health to 0. "Premium" cards are animated versions of existing cards with a shiny gold border. They can be obtained when opening card packs (at a much rarer rate than the card's normal version), included in specific promotions such as pre-orders, or soul-summoned at a cost of four times its non-animated version. A title (The Resplendent) can be earned for winning a game with a fully-premium deck. If a card that creates other cards (such as Pack Wolf) or transforms other cards (such as Mummify) is premium, the affected cards will inherit its premium status. Premium cards that are transformed into other cards still retain their premium status. Only non-trainable cards have obtainable premium variants. On occasion, alternate-art copies of cards are given out. These are premium cards that have different art, and are usually more ornate than other premium cards. Any alternate-art card in your collection cannot be soul trapped, nor can they be soul summoned. You will not see alternate-art cards in your collection, unless you own them. Alternate-art cards are most commonly available with purchasable bundles, or for participation in Grand Melee events. For a list of cards that have alternate-art variants, see the relevant category. Core — Cards from the base game. 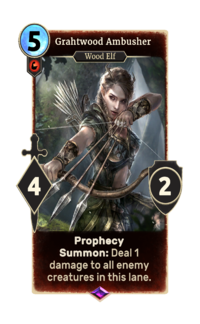 Heroes of Skyrim — Cards themed after The Elder Scrolls V: Skyrim (released June 28, 2017). Houses of Morrowind — Cards themed after the Great Houses of Morrowind (released April 5, 2018). Dark Brotherhood — Cards added by the story The Fall of the Dark Brotherhood (released April 5, 2017). Clockwork City — Cards added by the story Return to Clockwork City (released November 30, 2017). Isle of Madness — Cards added by the story Isle of Madness (released 24 January, 2019). Monthly Cards — Cards earned by playing Ranked mode. Madhouse Collection — Cards celebrating the Chaos Arena (released December 14, 2016). Forgotten Hero Collection — Cards celebrating the end of the Forgotten Hero's saga (released February 1, 2018). FrostSpark Collection — Cards that augment a wide variety of deck archetypes with unusual game interactions (released November 1, 2018). Festival of Madness — Cards that were temporarily available from the store during the 2018 Festival of Madness event. For a list of all cards sorted alphabetically, see the category. All cards have audio. Creature cards have audio for being summoned, attacking, being destroyed, and for several effects. Item cards have audio for being equipped. Support cards have audio for being summoned and being activated. When a card is summoned, the pitch varies slightly, so that two identical cards played in succession may sound slightly different. This page was last modified on 30 January 2019, at 13:45.